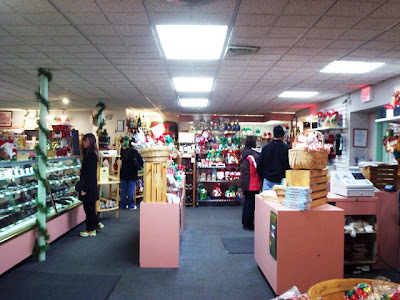 When I was a kid, Mom and I used to go into the old South Main Place in Fall River to visit our favorite candy shop - Dorothy Cox's Chocolates. A friendly woman behind the counter used to give me a sample of whatever candy she had out because I was so charming and adorable (nothing has changed, of course). Unfortunately, that location closed years ago, and now the entire South Main Place has turned into the site of the new courthouse. 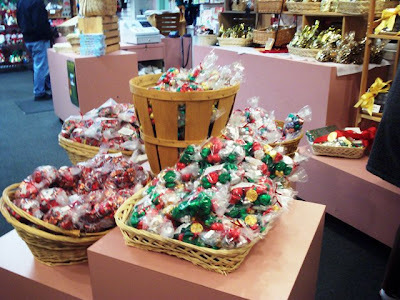 However, the candies that Mom and I loved are still alive and well in Fairhaven, and have been there since 1928. After winning two $10 gift certificates from MenuJoy.com, Mom and I decided that now was the perfect time to stock up on some Christmas candies. We pulled into the parking area at around 5:15 p.m. I apologize if the outside pictures are a little blurry; I was probably shaking from the cold ... and the excitement of getting candy. 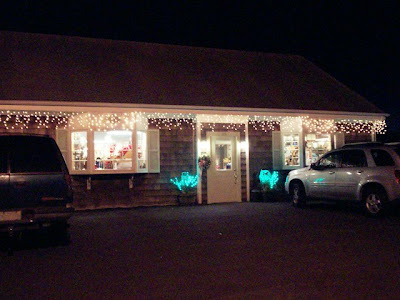 We had been to this location several times before, and just knew that the staff would have the place decked out for the holidays. We were right! It was gorgeous inside, and the delicious candies were the main attraction. The staff at Dorothy Cox is always very pleasant and helpful. There were a few staff members helping one customer track down some peanut brittle, and a few others behind the counter handing out samples to some children that had come in. After seeing all the delicious-looking candy, it was decided that Mom and I would not be saving these treats for Christmas. We would be putting them out for us (and mainly Dad) to enjoy now. We also figured that since we had $20 worth of freebies, we would be able to get several bags of different things and perhaps even a bag of cashews. 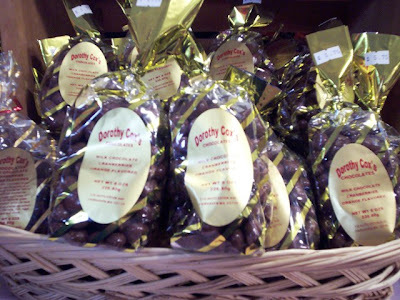 Famous for their buttercrunch, Dorothy Cox has everything you can think of, and it's all covered in chocolate. One of my favorite things (that we didn't get this time) is the chocolate covered potato chips. It is the perfect blend of sweet and salty flavor that you just can't get enough of. When I told the gentleman at MenuJoy.com about our visit to Dorothy Cox, he informed me that he had just eaten some chocolate covered jellies and chips after lunch. I'm jealous! I was on a search for some chocolate covered blueberries, but alas, there was none to be found. I guess they're just not in season anymore, but I was not too broken up about it because there were so many other things that I wanted. 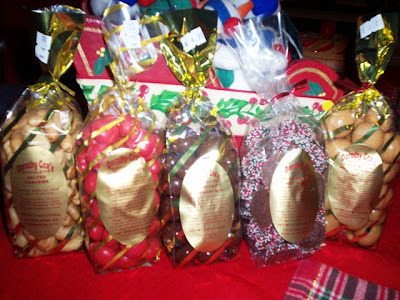 We finally settled on getting a bag of salted cashews ($4.98), milk chocolate macadamia nuts ($4.25), milk chocolate cherries ($4.25), peanut butter malted milk balls ($4.25), and milk chocolate non pareils ($5.50) that were decorated in Christmas colors. 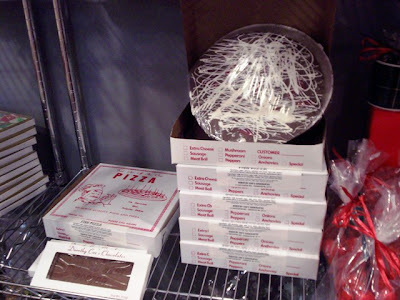 One of the things at Dorothy Cox that I would like to try is their chocolate pizza. It always looks so good. I guess it's just a big ol' slab of chocolate topped with various nuts and candies and drizzled with white chocolate. You really can't go wrong with any of that, can you? 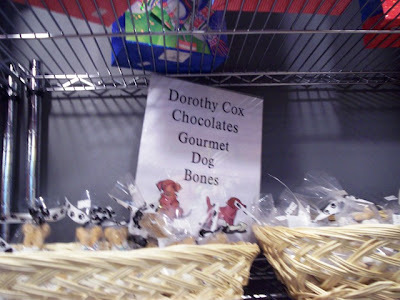 Dorothy Cox has a popular line of sugar-free candies and chocolates. They even have some gourmet dog bones so that your beloved pet can have something in his or her sock for Christmas! This family-owned candy shop really does cater to everyone. 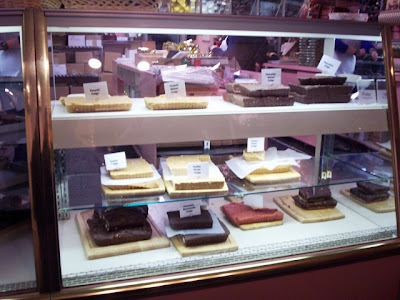 One of my favorite parts of the store is the fudge counter. 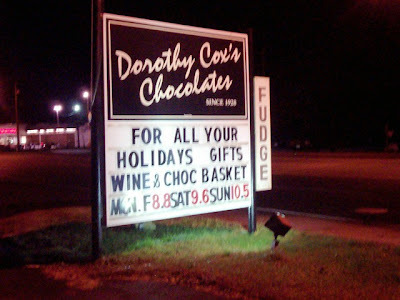 I adore fudge, and like everything else from Dorothy Cox, it is homemade. There are several flavors to choose from and they are always stocked with plenty for everyone. If you're keeping track, that's $2.75 from one order, and $.48 from the next - a grand total of $3.23 for over $20 worth of candy and nuts! We just love MenuJoy.com, and were very lucky to have won these certificates. If you haven't joined yet, please do! 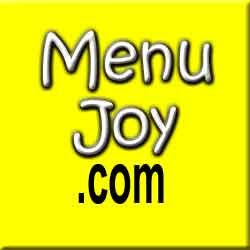 Visit www.menujoy.com for more information. We said goodbye to the gentleman behind the counter and headed off into the night for some dinner and Christmas shopping. When we got home, we laid out all the bags of candy for Dad to look at. He was in heaven! Although he hasn't had any yet, he's definitely looking forward to digging in after a long day's work. Mom and I busted open the bags right away to get a single sample out of each so that we could have a taste test. They were all as delicious as we had hoped they would be. The peanut butter malted milk balls are huge, while the red-colored chocolate cherries are sweet and tart. The salted cashews, as well as the milk chocolate macadamia nuts, were fresh and large, and the non pareils were sweet and crunchy. Each treat was better than the next, and Mom and I can't wait to go back. 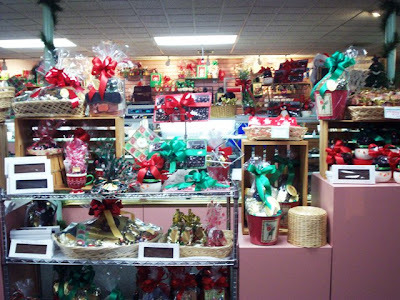 If you haven't gone already, please stop in ASAP to get your Christmas goodies. You'll be the hit of your office party and the star of your family gathering! 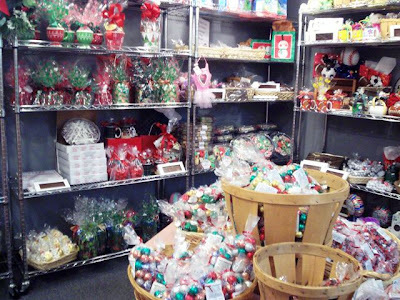 The holiday hours for Dorothy Cox's Chocolates are from 8 a.m. to 8 p.m. Monday through Friday, from 9 a.m. to 6 p.m. on Saturday, and from 10 a.m. to 5 p.m. on Sunday.